This plugin integrates Spotify with your MusicBee library. 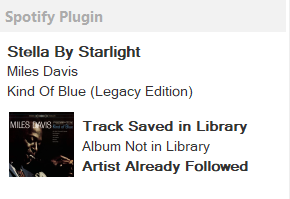 You can add albums and tracks and follow artists directly from MusicBee, through the plugin interface. Just extract the contents of the "plugins" folder to your MusicBee Plugins directory. Performance issues due to a workaround I implemented because of a bug in the Spotify API. Adding/removing albums is slow. The first track you play after enabling the add-in is slow to load. Only supports album-control for up to 500 saved albums in Spotify due to this workaround. You have to re-authenticate hourly due to a limitation with the Spotify API. I plan to do this silently in the future.